General Atomics Aeronautical Systems’ range of Predator autonomous aircraft has reached five million flight hours after completing 360,311 missions since its introduction in the 1990s. General Atomics said Monday the fleet of remotely piloted aircraft achieved 500,000 flight hours from 1993 to 2008, one million hours in 2010, two million hours in 2012, three million hours in 2014 and four million hours in 2016. “Our 25-year history has produced a lists of ‘firsts’ in RPA development and we have leveraged this progress to apply the latest technology and advancement in our new and improved aircraft, such as the MQ-9B SkyGuardian,” GA-ASI CEO Linden Blue said. The two million flight hours that the Predator B/MQ-9 Reaper drone fleet has recently achieved also contributed to 40 percent of GA-ASI’s five million total flight hours. 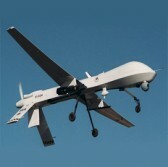 The General Atomics company deploys RPAs to support the militaries and government agencies of the U.S. and foreign customers. The Predator series include Predator A and Predator XP, Predator B/MQ-9B Reaper, Guardian, Predator B/MQ-9B Reaper Extended Range, MQ-9B SkyGuardian and SeaGuardian, Gray Eagle and Predator C Avenger/ER.